2018 College Football MVP’s Of Week #6! Ohio State Sophomore Quarterback Dwayne Haskins Jr (6-3, 220) Completed 33 of 44 Passes for an Incredible Career-High 455-Yards and another Incredible 6 Touchdowns and Rushed for 7-Yards, giving him 462-Yards and 6 Touchdowns as The #3 Ohio State Buckeyes pulled away in The Fourth Quarter to beat The Indiana Hoosiers in a 49-26 Victory on Saturday. 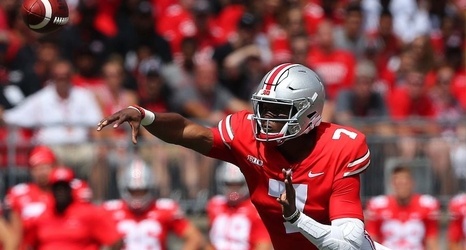 Haskins also Tied an Ohio State School Record with The Six Touchdown Passes and he Continued To-Add Incredible Stats for The Heisman Trophy Award as he Completed 2 Touchdown Passes to Both Parris Campbell and Terry McLaurin, and One Touchdown Pass to both Johnnie Dixon and Binjimen Victor. The 455-Yards Passing by Haskins was 3-Yards short of The Ohio State School Record of Art Schlichter and The Six Touchdown Passes tied another Ohio State School Record held by J.T. Barrett and Kenny Guiton. After this Game, Haskins Leads The Country with 25 Touchdown Passes. Ole Miss Senior Athletic Quarterback Jordan Ta’amu (6-2, 210, 4.76) had an Incredible Game in an Ole Miss Rebel 70-21 Victory over UL Monroe as he Completed an Incredible 21 of 24 Passes for 374-Yards and 3 Touchdowns and he also ran for another 63-Yards and 2 Touchdowns, giving him an Incredible 437-Yards of Total Offense and 5 Touchdowns and an Amazing 259.6 Quarterback Rating. Iowa State Freshman Athletic Quarterback Brock Purdy (6-1, 202) had an Incredible Game as he Completed 18 of 23 Passes for 318-Yards and 4 Touchdowns and he Rushed for Another 84-Yards and Another Touchdown, giving him 402-Yards and 5 Touchdowns in The Huge 48-42 UPSET Victory over The Oklahoma State Cowboys. Purdy also has an Incredible 243.1 Quarterback Rating. Northwestern Senior Quarterback Clayton Thors0n (6-4, 226) Completed 31 of 47 Passes for 373-Yards and 3 Touchdowns and Rushed for another Touchdown, giving him 4 Touchdowns in The Huge Northwestern Wildcats 29-19 Victory against Michigan State. The Alabama Sophomore Passing Duo of Quarterback Tua Tagovailoa (6-1, 218) and Wide Receiver Jerry Jeudy (6-1, 192) were Incredible in The Crimson Tide 65-31 Victory over The Arkansas Razorbacks and they both only played basically in the First Half. Tagovailoa Completed 10 of 12 Passes for 334-Yards and 4 First-Half Touchdowns and The Tide Reached 45 Points in their First Six Straight Games for The First Time in Crimson Tide History. Tagovailoa hit Tight End Irv Smith Jr on The First Play of The Game with a Crossing Pattern Across the Middle and Smith Raced 76-Yards for a 7-0 Lead with only 21 Seconds into The Game and then Threw Two Touchdown Passes to Jerry Jeudy for 42-Yards and 60-Yards in The Second-Quarter. Tua has yet to Throw a Fourth-Quarter pass as Alabama has outscored its Opponents by a Combined 336-96. New Mexico Lobo Junior Athletic Quarterback Sheriron Jones (6-3, 196) Completed 13 of 20 Passes for 250-Yards and 4 Touchdowns and Rushed for Another 72-Yards , giving him 322-Yards of Total Offense in The Lobos 50-14 Victory over UNLV. Jones also had an Incredible 236.0 Quarterback Rating. Texas Sophomore Quarterback Sam Ehlinger (6-1, 205) Completed 24 of 35 Passes for 314-Yards and 2 Touchdowns and ran 72-Yards and 3 more Touchdowns in The Huge 48-45 Longhorn Victory over The #7 Oklahoma Sooners in The Cotton Bowl Stadium. The Victory Also Gave The Longhorns its First Five-Game Winning Streak since 2013. The Sophomore Quarterback converted on a Third-and-3 on The Longhorns Final-Drive with a 4-Yard Quarterback Keeper and then his 8-Yard Draw Up-The-Middle of the field set up The Winning 40-Yard Field Goal Kick With 9 Seconds Left in The Game. Mississippi State Senior Athletic Quarterback Nick Fitzgerald (6-5, 230) Ran for 195-Yards and 2 Touchdowns and Passed for Another 69-Yards, giving his 264-Yards of Total Offense in The Bulldogs 23-9 UPSET Victory over #8 Auburn. The Bulldogs came into The Game among The Top 10 Teams in The Country in Scoring Defense, and The Bulldogs were brilliant again on that side of the ball. The Bulldogs Offense was a Two-Man Show between Fitzgerald and Sophomore Running Back Kylin Hill. Fitzgerald became The SEC Career Leader in Quarterback Rushing Yards with his 39-Yard Run in the Last Quarter as he Passed Former Florida Super-Star Quarterback Tim Tebow. Hill (5-11, 215) finished with 126-Yards on 23 carries, including Several Fabulous and Critical Runs in The Second Half. The Bulldogs finished with 349-Yards Rushing. South Florida Junior Running Back Jordan Cronkrite (5-11, 207) Rushed for an Incredible 302 yards on 23 Carries and Scored 3 Touchdowns and with an incredible 13.1-Yards Per Carry Average in The South Florida Bulls 58-42 Victory over U-Mass and Improved Their Record to 5-0 for The Second Straight Football Season. Cronkrite, The Florida Gators Transfer, Broke both The South Florida School Record and The American Athletic Conference Single-Game Rushing Record. Wisconsin Sophomore Running Back Jonathan Taylor (5-11, 221) Rushed for 221-Yards on 24 Carries and Scored 3 Touchdowns, including an Incredible 88-Yard Touchdown Run in The Fourth Quarter, as The Wisconsin Badgers 41-24 Huge Big-10 Victory over The Nebraska Cornhuskers. Louisiana Lafayette Sophomore Running Back Elijah Mitchell (5-11, 221) Rushed for 191-Yards on 20 Carries and 3 Touchdowns and Caught 2 Passes for Another 34-Yards, giving him 225-Yards of Offense and 3 Touchdowns in The Ragin’ Cajuns 42-27 Victory over Texas State. Notre Dame Senior Running Back Dexter Williams (5-11, 215) Rushed for 178-Yards on 17 Carries in Leading The Irish to a 45-23 Victory over Virginia Tech. Clemson Freshman Slot Back Lyn-J Dixon (5-11, 175) Rushed for 163-Yards and 2 Touchdowns on 10 Carries and he also Caught 1 Pass for 41-Yards, giving him 204-Yards, 2 Touchdowns, and an 18.5-Yards Per Touch Average in The 63-3 Clemson Victory over Wake Forest. Florida Atlantic Junior Running Back Devin Singletary (5-9, 200, 4.42) Rushed for 168-Yards and Caught 1 Pass for 10-Yards and became The All-Time Florida Atlantic Career Rushing Leader and Led The Owls to Victory over Old Dominion in a 52-33 Victory. Singletary Broke The Record of My Good Friend, Alfred Morris, with His Rushing Record of 3,529-Yards in 2007-2011) with a 44-Yard Touchdown Run that gave The Owls a 52-33 Lead with 2:17 remaining in The Game. Singletary finished the Game with an Incredible 3,568-Yards Rushing. Clemson Sophomore Running Back Travis Etienne (5-10, 200) Rushed for 167-Yards and 3 Touchdowns in The 63-3 Clemson Victory over Wake Forest as The Clemson Tigers Rushed for 471-Yards in The Rout. Etienne had Touchdown Runs of 59, 3, and 70-Yards. Buffalo Bulls Freshman Running Back Kevin Marks (6-0, 200) Rushed for 167-Yards, including a 70-Yard Touchdown Run in The Third Quarter, giving The Bulls a 24-10 Lead in a 34-24 Victory over Central Michigan. The Ole Miss Wide Receiver Trio of Senior Damarkus Lodge (6-2, 204); Junior A.J. Brown (6-1, 230, 4.4); and Sophomore D.K. Metcalf (6-4, 230) were all Unbelievable as they All-Three Caught Passes for over 100-Yards. Lodge Caught 9 Passes for 179-Yards, including a 51-Yard Touchdown; while Brown Caught 9 Passes for 133-Yards and Moore Caught 4 Passes for 115-Yards and had 21 Kick Return Yards for 136-Yards of Offense in The 70-21 Ole Miss Victory over UL Monroe. Ohio State Senior Super-Star Wide Receiver Parris Campbell (6-1, 208, 4.2, 40, 4.16, 135) Caught 9 Passes for 142-Yards and 2 Touchdowns and he averaged 15.8-Yards per catch in The 49-26 Victory over Indiana. Campbell did not “Hold-Back” when Talking About his Quarterback and what he did on Saturday and what he has done in his First Six College Football Starts This Season. “I think you’re witnessing a Legend in the Making,” said Campbell. The things that he can do throwing The Football, The Leader that he is becoming, and obviously The Stats Speak for Themselves. Dwayne Haskins is a Unique Talent. His play has heightens The Play of Everybody, because of the things he can do,” Campbell said. Texas A&M Junior Running Back Trayveon Williams (5-9, 200) Rushed for 138-Yards and Scored The Winning Touchdown in Overtime and Caught 6 Passes for another 72-Yards, giving him 210-Yards of All-Purpose Yards in The Critical Aggie 20-14 SEC Victory over The #13 Kentucky Wildcats. Florida Junior Defensive End Jachai Polite (#99) Sacks LSU Tigers QB Joe Burrow (#9) in Gators 27-19 UPSET Victory over LSU! The Florida Defensive Duo of Junior Defensive End Jachai Polite (6-2, 265) and Junior Linebacker Vosean Joseph (6-1, 227) Were Unbelievably Impressive in The 27-19 UPSET Gator Victory over The Undefeated and #5 Ranked LSU Tigers. Polite Recorded 6 Tackles, including 4 Solo, 2 Quarterback Sacks, 3 Tackles for a Loss, Forced 1 Fumble, and had 2 Pass Breakups; while Joseph Recorded an Amazing 14 Tackles, including 4 Solo and 2 Quarterback Sacks. Arizona Sophomore Free Safety Scottie Young Jr (5-11, 195) Recorded 7 Tackles, including 5 Solo Tackles and 2 Interceptions. Young had Two Incredible Fourth-Quarter Interceptions and he Returned The Second Interception 24-Yards for a Touchdown to put Arizona up 24-14 with 3:13 to play and then The 24-17 Arizona Wildcats Victory over The California Golden Bears. North Carolina State Senior Linebacker Germaine Pratt (6-3, 240) Recorded 13 Tackles, including 6 Solo Tackles, 1 Quarterback Sack,Forced 1 Fumble, and 2 Quarterback Hurries in The 28-23 Victory over Boston College. Texas A&M Senior Defensive Tackle Kingsley Keke (6-4, 305) Recorded 5 Tackles, including 4 Solo, and 2 Quarterback Sacks in This Huge 20-14 UPSET Victory over The #13 Ranked Kentucky Wildcats in OVERTIME. The Miami Hurricanes Defensive Duo of Sophomore Defensive End Jonathan Garvin (6-4, 235) and Junior Defensive Tackle Joe Jackson (6-5, 260) were very Impressive in The Miami Hurricanes 28-27 Victory over their Florida State Rival. Garvin Recorded 5 Tackles, including 5 Solo Tackles, 2 Quarterback Sacks, and a Pass Breakup; while Jackson Recorded 4 Tackles, including 2 Quarterback Sacks, 2.5 Tackles for a Loss, 1 Pass Breakup, and a Quarterback Hurry. The Utah Defensive Duo of Sophomore Cornerback Jaylon Johnson (6-0, 190) and Junior Defensive End Bradlee Anae (6-3, 254) were Very Impressive in The 40-21 Utes UPSET Victory over Stanford. Johnson Recorded 7 Tackles, including 6 Solo Tackles and he Returned an Interception, 100-Yards for a Touchdown; while Anae Recorded 5 Tackles, including 4 Solo Tackles, 2 Quarterback Sacks, Forced 1 Fumble , and 1 Pass Breakup. Wisconsin Senior Linebacker T.J. Edwards (6-1, 242) Recorded 7 Tackles, including 3 Solo Tackles, and 2 quarterback Sacks in The Badgers 41-24 Victory over The Nebraska Cornhuskers. Clemson Junior Linebacker Tre Lamar (6-4, 250) Recorded 8 Tackles, including 6 Solo Tackles and 2 Quarterback Sacks in The 63-3 Rout of Wake Forest. Middle Tennessee Junior Linebacker Khalil Brooks (5-11, 206) Recorded 11 Tackles, including 4 Solo Tackles, 2.5 Tackles for a Loss, 2 Quarterback Sacks, and a Quarterback Hurry in The Blue Raiders 34-24 Victory over Marshall. San Diego State Freshman Cornerback Darren Hall (6-0, 175, 4.4) had a Fabulous Game as he Recorded 9 Tackles, including 8 Solo Tackles, 1 Quarterback Sack, 1 Forced Fumble, and a Key Interception in The Aztecs 19-13 Victory over Boise State. The Miami (Ohio) Defensive Duo of Senior Linebacker Brad Koenig (6-1, 225) and Junior Defensive Tackle Doug Costin (6-2, 285) were Really Outstanding in The Miami (Ohio) Redhawks 41-17 Victory over Akron. Koenig was Especially Impressive as he recorded 4 Tackles, including 3 Solo Tackles, had 1 Tackle for a Loss, Forced a Fumble, Recovered a Fumble, and 2 Interceptions; while Costin Recorded 4 tackles, including 3 Solo Tackles, 1.5 Quarterback Sacks, and a Quarterback Hurry. New Mexico Senior Defensive Tackle Cody Baker (6-3, 293) only Recorded 2 Tackles, but they both were Quarterback Sacks in The Lobos 50-14 Victory over UNLV. Georgia Southern Junior Cornerback Monquavion Brinson (5-10, 180, 4.42) Recorded 7 Tackles, including 6 Solo Tackles, 1 Interception, and 2 Pass Breakups in The Eagles 48-13 Sun Belt Conference Win. Brinson Set-Up The Eagles First Touchdown when he Recorded an Interception and Returned it to The 5-Yard Line. Texas Freshman Kicker Cameron “Dicker The Kicker” Dicker (6-1, 205) Kicked a 40-Yard Field Goal with Nine Seconds left, in the Game, to give The #19 Texas Longhorns a 48-45 Huge UPSET Victory on Saturday over The #7 Oklahoma Sooners after Sooner Quarterback Kyler Murray had Rallied The Sooners with 3 Touchdowns in the Fourth Quarter. Florida Junior Punter Tommy Townsend (6-1, 175) had a Very Impressive Game in The LSU UPSET Victory as he had 9 Punts for 432-Yards, including a 70-Yard Punt and Averaged an Incredible 48-Yards in The 27-19 UPSET Victory over The LSU Tigers. Notre Dame Senior Punter Tyler Newsome (6-3, 214) had a Very Impressive Game Against Virginia Tech as he had 3 Punts for 143-Yards and a tremendous 47.7-Yards Per Punt Average in The Irish 45-17 Victory over Virginia Tech.